OSAKA - Ryoichi Adachi’s three-run, eighth-inning triple powered the Orix Buffaloes to a 6-3 come-from-behind victory over the Chiba Lotte Marines in Pacific League play on Saturday. With his team trailing 3-2, the slumping Adachi came to the plate with two outs and the bases loaded after Marines reliever Naoya Masuda (2-6) had walked the first two hitters and hit a batter with one out. Adachi lifted a low 1-1 pitch to straightaway center. With center fielder Shohei Kato playing shallow and toward right field against the light-hitting Adachi, he was unable to haul in the ball for the third out. “I hadn’t been able to buy a hit and hadn’t been pulling my weight, so regardless of how I did it, I’m happy to have that hit,” said Adachi who came to bat in the eighth inning in a 7-for-72 slump since the start of July. Kengo Takeda followed with a single that scored Adachi. The big inning took Orix starter Donn Roach off the hook for the loss. Roach had allowed three runs — two earned — but had been yanked after three innings. Reliever Taisuke Yamaoka pitched out of a bases-loaded jam in the fourth and worked 3-1/3 scoreless innings. Lefty Nobuyoshi Yamada (1-0) entered in the seventh with one out and a runner in scoring position. 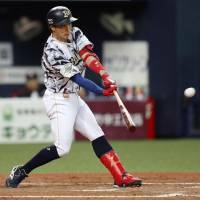 He retired Lotte’s best hitter, Katsuya Kakunaka, and the Marines captain Daichi Suzuki to escape the jam and worked a 1-2-3 eighth to pick up the win. Lotte starter Mike Bolsinger settled down after the second inning, and left after allowing two runs over six innings. But his efforts came to nothing in the end as Buffaloes closer Hirotoshi Masui closed it out by setting three batters down in order in the ninth for his 27th save. Bolsinger allowed a run in the first on two singles and a sacrifice fly from veteran Hiroyuki Nakajima. The Marines went ahead in the second on Kakunaka’s fifth homer and a Tatsuhiro Tamura RBI single. After Yuki Miyazaki doubled in the tying run in the bottom of the second, Suzuki’s sacrifice fly made it a 3-2 lead in the top of the third. At Fukuoka’s Yafuoku Dome, Kensuke Tanaka belted a two-run, ninth-inning single to break a 1-1 tie and lift Hokkaido Nippon Ham past Fukuoka SoftBank. Hawks rookie Kotaro Otake, making his second career start, allowed a run over six innings, while Fighters starter Nick Martinez did the same. At Sendai’s Rakuten Seimei Park, Brian Wolfe (4-3) allowed six hits over seven innings and two relievers provided perfect relief, while Hideto Asamura homered and drove in four runs in Seibu’s lopsided victory over Tohoku Rakuten. At Nagoya Dome, Tetsuto Yamada rapped a game-tying single in the seventh, and a two-run single that put Tokyo Yakult ahead for good against Chunichi in the ninth. Yamada also smacked his league-leading 28th home run. At Yokohama Stadium, Ryutaro Umeno and Willen Rosario each drove in two runs, while Taiki Ono (6-3) allowed three runs over 7-2/3 innings to earn the win as Hanshin clobbered Yokohama.